Toys from @HABA_usa that Break Down the Gender Barrier! According to recent market trends, toymakers everywhere are tossing the girl/boy idea out the window! These types of gender neutral baby toys are great for baby showers where then gender is not known. And they last through several children whether parents have boys or girls! With this sorting box, children have twice as much fun! Just like in a real zoo, within every vivarium there is a slide: If pushed down, only the half wood shapes fit through the opening. If pushed upward, the opening is large enough for the whole wood shape. This is fun because as children play, they can pretend to feed the animals while becoming more familiar with color and shape recognition. This makes a great 1st birthday party gift and it is so great for children's fine motor and intellectual development. Free threading or following the templates? Little threading experts can choose with this toy! If there are two players, they can play an exciting tactile game and take turns to pull the play figures out of the tactile bag. Set comes with 2 threads with stable, 1 cow, 1 calf, 1 horse, 1 foal, 1 cloverleaf, 1 flower, 1 milk churn, 1 horseshoe, 4 templates, 1 little tactile bag. 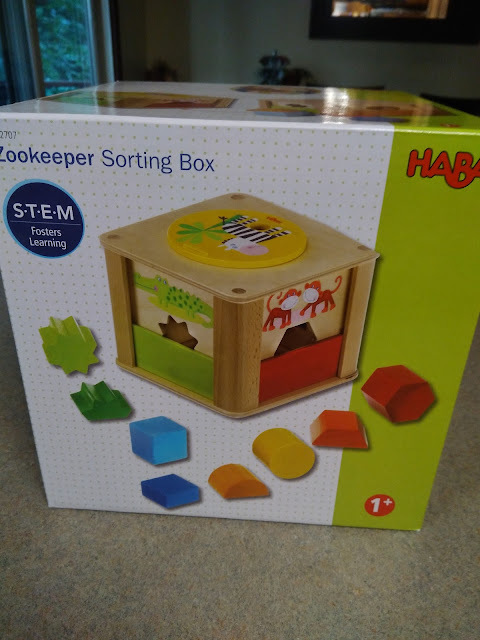 This one is so great for developing children's fine motor skills and language skills! 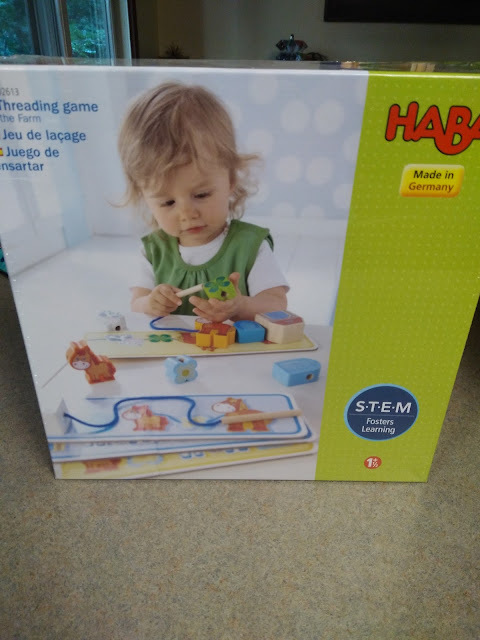 You can purchase both these HABA toys from their website.